This is the first full and properly researched biography of all five Marx Brothers—Chico, Harpo, Groucho, Gummo and Zeppo. First and foremost, this is the saga of a family whose theatrical roots stretch back to mid-19th century Germany. 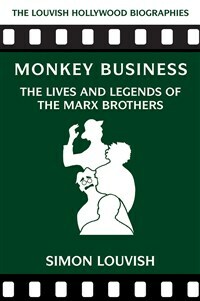 From Groucho Marx’s first warblings with the singing Leroy Trio, this book brings to life the vanished world of America’s wild and boisterous variety circuits, leading to the Marx Brothers’ Broadway successes and their alliance with New York’s theatrical lions, George S. Kaufman and the “Algonquin Round Table.” Never-before-published scripts, well-minted Marxian dialogue, and much madness and mayhem feature in this tale of the Brothers’ battles with Hollywood, their films, their loves and marriages, and the story of the forgotten brother Gummo. Simon Louvish is a biographer of comedians and author of satirical and outrageous fiction. He is a film screenwriter and teaches film at the London Film School. His film biographies include, Man on the Flying Trapeze: The Story of W. C. Fields, Chaplin: The Tramp’s Odyssey, Stan and Ollie: The Roots of Comedy, Keystone: The Life and Clowns of Mack Sennet, Cecil B. DeMille: A Life in Art, and Mae West: It Ain't No Sin.